Hi All, I have been traveling and very, very sick this week. I am coughing almost every minute or so. Therefore, I was unable to create the video and post the answer to the last Friday Challenge. However, we had 3 successful entries from Pete, Leonid and Don, who all made a perfect spectrum charts. I should be able to post that answer on Monday. In the meantime, I wanted to give you a new challenge. and will post the answer on Tuesday. 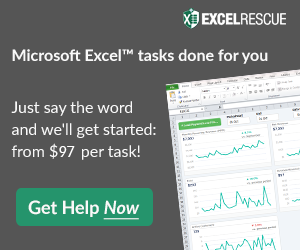 Here is the Excel user question. How would you solve it? “I have some Excel data represented like so. I’m not very good at charting so this is probably kind of simple. Leave me a comment if you want to submit an answer and I will send you a personal email. He/she does not need a graph, they need conditional formatting. I agree. Conditional Formatting is cleaner and easier for this request.